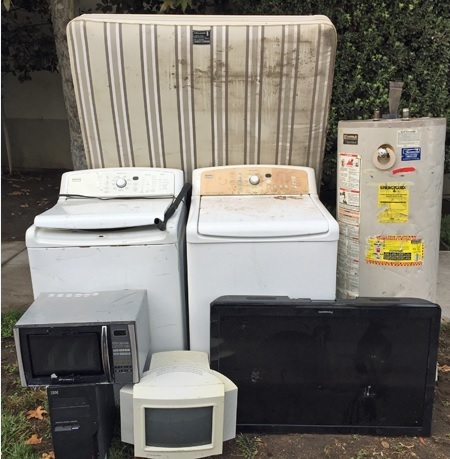 Residents with trash and recycling service in the unincorporated area of the county are entitled to two free “bulky item” collections per year. These special pick-ups include appliances (e.g. refrigerators, stoves, hot water heaters, dishwashers, washing machines, dryers, etc. ), electronics (e.g. old TVs, computers, stereo equipment, etc. ), furniture (e.g. couches, tables, beds, mattresses, etc. ), and other items that are too large to fit in residential trash containers. No loose trash or construction and demolition materials are allowed. Call your hauler (either MarBorg or Waste Management) to tell them what items you have and schedule an appointment. The program also includes multi-family complexes, such as apartments and condos. Complexes are entitled to receive up to two bulky item pick-ups per year per complex. Each complex manager must make arrangements with the local hauler to determine a central location and dates for the service. Check out our quick video here.